I, (full name in block letters), son/ daughter of solemnly declare that to the best of my knowledge and belief, the information given in the return and the schedules thereto is correct and complete and is in accordance with the provisions of the Income-tax Act, 1961. I further declare that I am making returns in my capacity as and I am also competent to make this return and verify it. Many tax payers are confused on what should the enter in my capacity as? 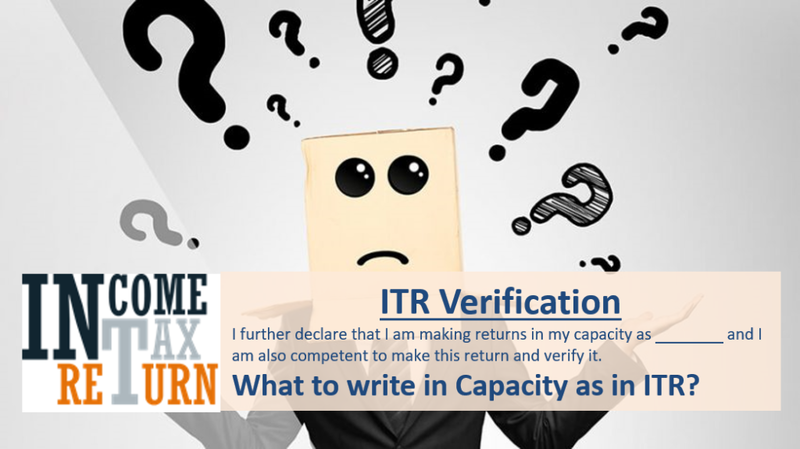 I hope this resolves the doubt about what to fill in the my capacity as in the ITR Forms. I have tried all the options but the XML fails to upload because of the error in this field. it is not accepting any value and I am stuck up. Please help. Download the excel new utility PR4 from income tax website. Earlier excel utility had a problem that it always converted the value entered in capacity to capitals whereas income tax website expects “Self” word. New utility has dropdown so you will be able to generate XML with this change and upload. Also there is option in excel utility to import from previous version which you can use to import your details from PR3 version to PR4 which will save your time for reentry.